Banos literally translates to Bathrooms (though in this case it’s just baths) and maybe doesn’t sound so immediately appealing but imagine if your bathroom was one amazing shower made from waterfalls with huge bathtubs filled with healing water that has cascaded from ancient Andes mountains, heated by volcanos, picking up rich nutrients the whole way down, replenishing your soul, soothing your body, and relaxing your mind. Add to that scenic shading, misty clouds lightly floating past, hugged in closely by the wall of mountains, fine air to breath, and the surround sounds of rushing rivers. Now if only you could be the only one. There are many locations with several pools of varying temperatures, from scolding to freezing that make up the man made structures. They are constantly cleaned and replenished with fresh water but the therapeutic hot springs are no secret and tranquil soaks can quickly turn to feeling a little like a crowded hotdog in a boiling pot. Go at the right time to the right one and you can enjoy hours of empty space. The small town of Banos is a hub for so many activities that you end up with a remote town turned crowded tourist hotspot, like a disneyland for nature. Rafting, cycling, canyoning, rappelling, bungee jumping, off-roading, all of it available and affordable. Tired of fighting for space in the thermal pools of Banos, you can come up for air at the Casa del Arbol, a little ways out of town. 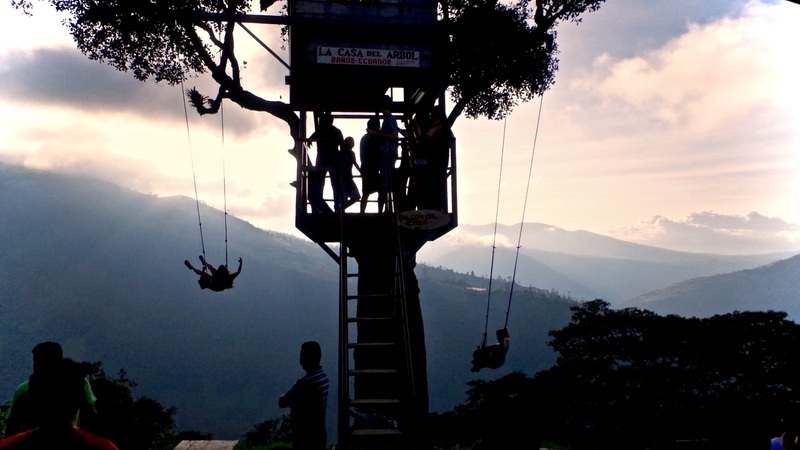 Everyone knows about this place too but when you’re flying on a swing dangling from a treehouse, made of a single slab of withered wood, held by questionably sized rope, that seat is all yours for at least an entire minute. Fly free little bird, fly free. Swinging over the sudden cliff flashes views of far away green houses straight below as the solid Tungurahua volcano sits unmoved by fast rolling clouds. So high up it feels like with each push you just might get close enough to kick the blazing sun. Fun stuff, Ecuador, fun stuff.